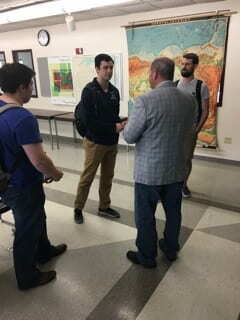 On Tuesday, April 24, 2018, students in Prof. Aaron Weinschenk’s (Political Science, Public and Environmental Affairs) Congress: Politics & Policy class had the rare opportunity to hear about the legislative process from a former member of Congress, Reid Ribble. Ribble has been visiting Weinschenk’s class for the last three years. During this year’s visit, Ribble shared stories about what motivated him to run for office, interactions with other elected officials and a trip to Cuba with President Obama in 2016. 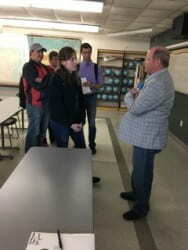 He also provided his thoughts on the current political landscape, including President Trump, polarization and the changing nature of the legislative process. 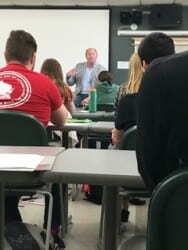 Ribble is currently the CEO of the National Roofing Contractors Association, but maintains ties to the Green Bay area through speaking engagements like the one in Weinschenk’s class and his service on the Chancellor’s Council of Trustees. This entry was posted in News and tagged CAHSS, Political Science, Public and Environmental Affairs on April 30, 2018 by Editorial Student.